Based in Chicago, I have been providing Tarot readings for over 25 years. Besides private readings, I can be found at various locations throughout Chicago. Contact me and we can arrange what works best for you. The 78 cards of the Tarot deck are made up of Major and Minor Arcana, which basically means “big” and “little” secrets. Read more about the Tarot here. 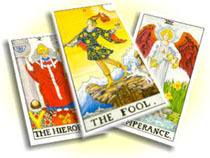 The Tarot is an objective tool in the pursuit of self-awareness, understanding and personal growth. Perhaps one of the hardest concept for those new to Tarot is that the cards never lie. The cards can be an invaluable tool for dealing with difficult situations. As a reader, I use my abilities to read the cards and the images presented to me to help you understand and bring out the answers within you. Just as I am not a “fortune teller”, neither is Tarot. Some of us want to “know” the future and this is possible as long as we don’t deny responsibility for our future choices by saying “the cards decided for me,” then the Tarot somehow, uncannily, seems to describe the patterns of behavior and the paths in front of us.